This leading liberal arts college debuted its new Barack Obama Scholars Program with a leave-behind for potential donors. The inspirational piece offers a big-picture view of the innovative program. Designer: Warren Group | Studio Deluxe. Perhaps now more than ever, the world needs a new generation of young people dedicated to public service—inspired and emboldened by the legacy of President Barack Obama. 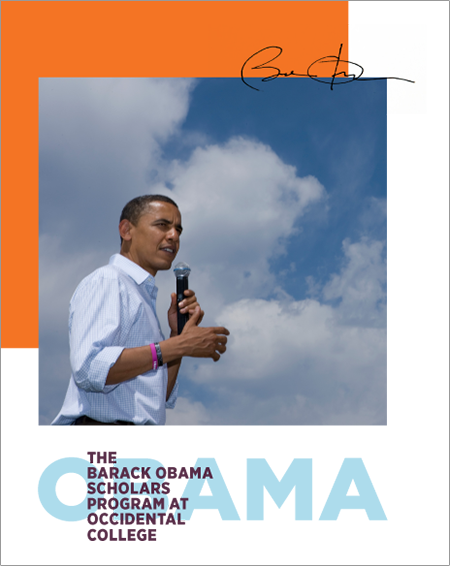 The Barack Obama Scholars Program at Occidental College will empower exceptional students committed to the public good as it honors and continues the principles of civic engagement President Obama advanced during his Presidency. These principles were shaped by the people and ideas Barack Obama encountered while a student at Occidental College. Now the Obama Scholars Program, with the wholehearted backing of President Obama himself, will open opportunities to students whose life trajectories might otherwise prevent them from realizing their full potential. As our philanthropic partner, your involvement will provide the foundation for this iconic program, which will nurture the agents of change who seek to realize a stronger society. With your support for the Obama Scholars Program, you will impact the future of our country. At the same time, you will pay tribute to and extend the legacy of President Obama by propelling subsequent generations to assume the baton of leadership. Our philanthropic partners will be able to contribute to shaping this unique program, including the possibility of serving on the Advisory Council and as a mentor to an Obama Scholar, if you choose. Your gift is an investment in the building of a more civil society, one that embraces and encourages diversity among people and viewpoints, and bridges these differences to create a stronger union. The Obama Scholars Program will transform individual lives and our collective whole, with reverberations for decades to come.